Some book a skiing break to pursue their sporting passions, whilst it is the nightlife that beckons others. Is it possible to find a healthy balance and make the most of what the day and the night has to offer? We caught up with Samantha Sharp to hear about her experiences of après ski. Q. 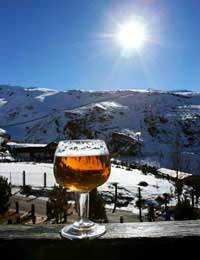 What entices you when it comes to booking a skiing holiday? A. I’m not the sort of person that enjoys lazing around on the beach. An active, demanding break is more my cup of tea. Having said that, I do enjoy good food, meeting new people and having a few drinks. For me, skiing offers the perfect combination of challenge and relaxation. Q. How do you prepare for a night out? A. Whilst I am always keen to hit the local bars and restaurants, I do need time to unwind when I come off the slopes. I usually head straight to my room and take a shower. I’ll often nap or read for an hour, to get some alone time. Then, I get ready to go out. I usually go skiing with a group of girlfriends and we love getting ready together. After a day wearing bulky, unflattering ski wear, it’s always a relief to get dressed up. Q. Can you describe a typical evening? Most nights we’ll go for an early, quiet dinner. We like to sample the local cuisine and especially love Italian food. After that, we’ll head to a bar and perhaps meet up with some new faces we’ve met that week. I love dancing and find it a great way to unwind my muscles after a hard day’s skiing. I’m not usually a fan of cheesy music but am happy to dance to anything on a skiing holiday! Sometimes, we’ll head on to a chalet party. Other nights, we’ll go back to the hotel relatively early to catch up on sleep. Q. How do you ensure you’re ready for the slopes in the morning? A. I have a cold shower each morning to wake me up. I also drink large quantities of green tea. It find it helps me to detox and the caffeine gives me a boost without the perils of dehydration. I always pack my favourite beauty products and apply plenty of moisturiser with a high SPF in the morning, hopefully giving my face a fresh appearance. Q. Do you find it difficult to achieve a balance between partying and skiing? A. After a few years of skiing breaks, I think I’ve mastering the art of making the most of the week. Whilst I love going out for several hours in the evening, on a typical night I won’t actually drink that much. I am also careful to eat well and drink a glass of water in between each alcoholic drink. I know that those who are particularly tired or hungover risk not being admitted onto the slopes and, on a personal level, I find that I can’t enjoy skiing if I’m feeling unwell. I mix big nights with a healthy quantity of quiet, early nights to keep up my stamina and wellbeing throughout the week. As Samantha’s story goes to show, those looking to make the most of both the slopes and the bars should seek to find a comfortable balance between parting and skiing. Plenty of sleep, eating sensibly, watching your alcohol intake and staying hydrated are all key tips when it comes to après ski.